When I was 11 years old, my mum collected my older brother and I from school and announced we were going on ‘a magical mystery tour’. With a vague recollection that this was the name of a Beatles album, I was completely clueless about what on earth she meant. It turns out, at the end of this ‘tour’, there was a little dog that we would be taking home with us! I named him Chaz, after a character from Rugrats. For almost 15 years now, this little man has stolen my heart. I wrote in a diary entry on the 21st November 2001: “Today is the best day of my life! We got a puppy!” And whilst most of that diary is quite comical to look back over now, I still stand by my enthusiasm on the day we bought home a flea-ridden, wormy little puppy that was so unclean I thought his fur was blond (until a long soapy rinse revealed the area around his neck was actually white!). It took a bit of work to get him tidied up, but he’s lived a happy, cosy and loving life ever since! It’s no secret that I love and respect all animals – but none have a place as close to my heart as ‘man’s best friend’. In the years that I’ve had Chaz in my life, I’ve gone through the entirety of high school, watched all three of my brothers get married, completed my A-Levels, become an Auntie (five times over), travelled to South Africa on my gap year (and spent three months working at the incredible Shamwari Game Reserve), achieved a first class degree (with a year’s study in Australia! ), gone through countless loves (and heart breaks! ), moved to London and begun forging a career here, met my wonderful partner and accepted a marriage proposal! It really is true to say, my loyal little dog has been there through every milestone in my life, and I can’t imagine what it will be like when he’s gone! So, I completely empathised with every word that Gary Edwards said about losing his beloved pet dog Norton at the beginning of his book Tales of an ‘underdog’ and how it inspired him to dedicate his life to rescuing dogs. “Norton was more than just a dog… to me anyway,” Gary writes. “He had been my faithful little friend for 13 years, and although I have always had dogs in my life, I guess that there are always those ‘special ones’, who touch our very souls”. I don’t know whether it’s true what they say about ‘only those who have owned a dog will truly understand’; I hesitate to agree with a sentiment that seems to be excluding to many – I, afterall, have never been in close proximity with, say, a dolphin, but I can certainly appreciate their intelligence, their complex social bonds and their sentient ways. But those who have had the privilege of sharing in the life of a dog will know how aware these creatures are: how they can pick their master out in a crowd; how they know what time of day you get home from work; how they can be protective in an unusual circumstance, such as when you’re home alone for the first time in a while; how they can display something akin to empathy when tragedy strikes or they find you crying. Like many people, I’ve heard of the dog meat trade that takes place in countries such as China. But before I delved too much into the facts and figures, I was curious to know just what people thought about the idea of dog meat as a delicacy, and tested the waters on my Facebook page with an image of meat-based meal identified as dog. Can we separate how something is killed with whether or not we should eat it? If the demand for dog meat creates a trade in which these animals are subjected to terrible abuse and even torture, is it not the demand that’s creating the problem? 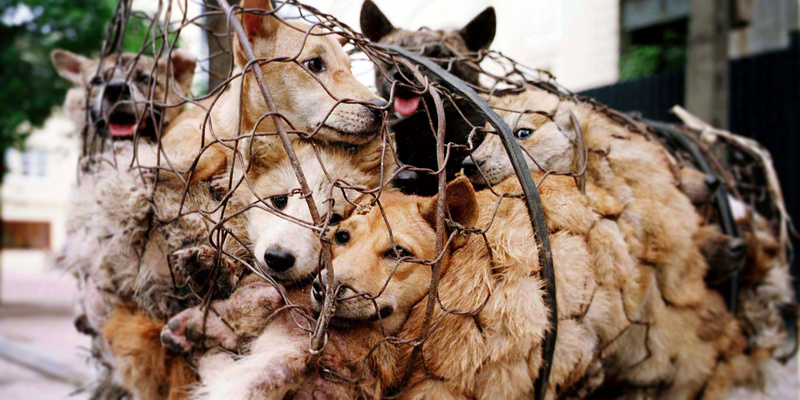 China (home to Yulin Dog & Cat Eating Festival) does not have any animal welfare laws and so animals are routinely abused in slaughtering practices. As Gary explains in his book, from the moment of being captured, dogs destined for the meat trade —often pets stolen off of the streets, some even make it to market with their collars still on! — are kept in cruel conditions. Perhaps focussing on their suffering is still perceived as ‘irrelevant’ to the question of whether or not we should eat them, but there should at least be room for the thought that dogs are domesticated at the hands of man, and so have evolved to trust us, to serve as a companion. Returning again to my entry point for studying the dog meat trade, the book Tales of an ‘underdog’ goes on to reference a fundraising event for dogs that had been victims of the dog meat trade, organised by Angels for the Innocent Foundation. The event, a comedy night organised by Anneka Svenska and hosted by Bill Oddie, is one that I’d attended last year. Anneka has rescued and re-homed dogs from all over the world, including more than 15 dogs rescued from the meat trade in Thailand. Earlier this year, she joined Humane Society International’s #STOPYULIN Campaign alongside Ricky Gervais, Chris Packham, Professor Green and many other celebrities.